If you are redesigning a traditional kitchen or starting from scratch in a new living room, how you choose to dress your windows will be an all important finishing touch. When assessing different options, consider the look and feel you want to create, and whether you prefer to draw attention to window frames and shapes or disguise them. It is also important to address any practicalities, such as retaining privacy, reducing draughts and insulating against cold and noise. From traditional curtains and shutters, to innovative blinds and window films, there is something to complement every living space. Find more beautiful window treatment ideas on our dedicated hub page. A beautiful fabric can make a great starting point for an interior design scheme; try picking out the colours and motifs to help inspire a palette and theme for a traditional living room. Set against a complementary soft and neutral backdrop, we love how Clarke & Clarke's beautiful Woodsford fabric has been used across curtains, cushions and an ottoman in this room to create a harmonious look. Find more inspiring window treatment ideas for living rooms; find out how to choose the best curtains, too. It's tricky to find space to hang artworks in a bathroom, so why not opt for a gorgeous statement print at the window instead? Pictured is the By the Sea fabric in Saffron/Charcoal from Vanessa Arbuthnott's Artists' collection which has been made into a roller blind. Find more pretty window treatment ideas for bathrooms; and read our guide to choosing roller blinds, too. Roman blinds come in different styles, so think about the overall look and feel you want to create. Hobbled Roman blinds are made using dowels so you get a neat pleated look when pulled up. Heavy fabrics like wool work well with this style, such as this Legacy, Broadway design in Mustard from Moon. Read our guide to choosing the best blinds to get the right design for your home; find out more about picking the best Roman blinds, too. For an easy way to control light levels in a room Venetian blinds are the perfect option. More affordable than sought after shutters, they have sleek fuss free design and are available in a range of finishes to match your decor. Often period homes have irregular sized windows, so in this case, opting for bespoke blinds from Hillary's is a great option. Alternatively Ikea has plenty of standard off the shelf designs. Working with a front facing living room? Intricate frosted window film will obscure the view into your room but still allow light to flow through. If a frosted film alone feels a bit bare, team it with curtains for a more opulent window treatment. Letting the curtain fabric pool on the floor, as here, will make the look more luxurious. Check out more of our window film design ideas. Frosted windows also work perfectly in a traditional bathroom, especially if it's a smaller bathroom as you won't need to overwhelm the space with bulkier window treatments. Designing a country kitchen? Opt for a lightweight, pretty floral blind like this Roman blind, made up in Cath Kidston fabric. Roman blinds are perfect if you like the softness of a fabric window treatment but don’t have space for curtains in your kitchen. Find more kitchen window treatments in our guide. 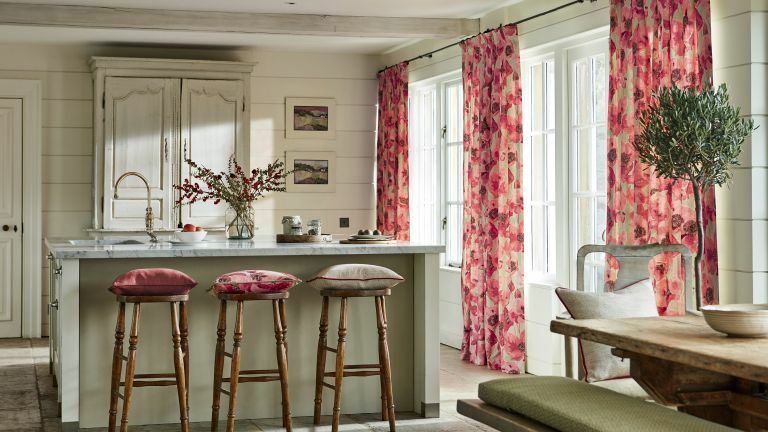 If you love colourful bold prints, but are cautious when it comes to using them, opting for curtains and soft furnishings in statement fabrics is a great solution, as they are relatively cheap and easy to update as and when tastes change. Covered with a blowsy poppy design, Sanderson's Embleton fabric in Claret/linen brings warmth to this large muted kitchen. See more kitchen window treatment ideas in our guide. Velvet’s a huge trend for sofa upholstery and we think it’s just as appealing used for curtains. While roller blinds and shutters both work well in traditional space, nothing beats the luxurious look of velvet curtains with deep swags, lush fabrics and ornate pelmets. Tier-on-tier shutters have two sets of panels sitting top and bottom, giving you the flexibility to operate them separately, and greater control over the levels of light and privacy. Furnishing a period room? Pick smaller slats for a more traditional appeal; wider slats for a more contemporary one. These hardwood shutters at Apollo Blinds, are bi-fold opening for enhanced versatility. Find more information and inspiration for shutters in our guide. If you're looking to maximise light then voile curtains are the answer, plus they're perfect for popping up in summer to keep spaces cool while maintaining privacy. These voiles from John Lewis & Partners have a slot top so are easy and quick to thread onto a curtain pole or cord. Discover more practical and pretty treatments for French or patio doors. Make windows the focal point in an otherwise neutral space by choosing shutters in a bolder colour. Opt for a strong shade that you can repeat throughout the room – we can't get enough of the olive hues in this bedroom. Find more smart bedroom window treatments in our guide. We know pelmets may be associated with the chintzier end of traditional country house design, but when they are done right they can lend style and elegance to a window. They are also a great way to hide fixtures, here a pelmet has been used to disguise a simple roller blind – a good idea if you want to add interest to a window but don’t have the room for bulky treatments. Picking fabrics that don't entirely match but complement each other carefully is easy to do if you shop from one collection. Here, the border on the blind creates a smart finish, exaggerates the prevalence of the blue in the scheme and creates a slightly smarter edge. Fabrics by Vanessa Arbuthnott. Find out how to mix patterns and plains in our design guide. If you've chosen a strong wallpaper design for your room, picking out a block plain for your window treatment will keep the scheme feeling elegantly restrained. Choose a dark colour only if the window is large and the natural daylight is good. In a period home, there are lots of good reasons for dressing a doorway just as you would a window. Probably the most pratical is that period homes can be draughty, and this is a clever way to combat this, plus if you pick a patterned print it's a really quick and easy way to add some interest to a space. Looking for more window treatment inspiration?